The child should learn as early as possible to advocate for themselves. This should be part of the Individual Education Plan (IEP). The educational staff should allow the child to say what he/she cannot see, in what position in the class they see best, or if they do not feel safe. Self-advocacy is one of the most important social, emotional, and educational skills we can teach. 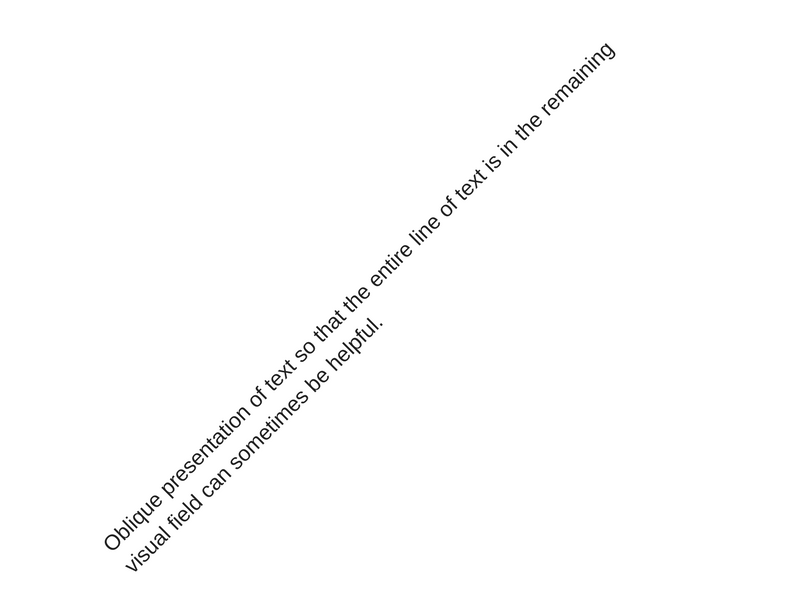 Oblique presentation Rotating the page 45-90 degrees, so that the entire line of text is in the remaining visual field, can be helpful for some children. Research shows that it is most helpful for right hemianopia. Wood stick method This method has the child use a long wooden stick on a chalkboard or whiteboard which they move from word to word as they read off a board. Children with left-sided hemianopia (which results after right-sided surgeries) are asked to tap the wooden stick on the beginning of the next word. Children with right-sided hemianopia (which results after left-sided surgeries) are asked to tap the wooden stick on the end of the next word. This teaches the child to shift their gaze intentionally (known as attentional gaze shift) into the blind field. In adults who have hemianopic visual loss, this method showed improved reading after a few weeks. Long gaze shift method This method requires the reader to scan all the way to the end of the line first so they understand how many words are in the line as well as the length of each word. This requires the child to perceive each word as a whole first before reading it. Boundary marking devices Boundary marking devices, such as translucent plastic with a bright red boundary line, can help the child scan to the next line of text. 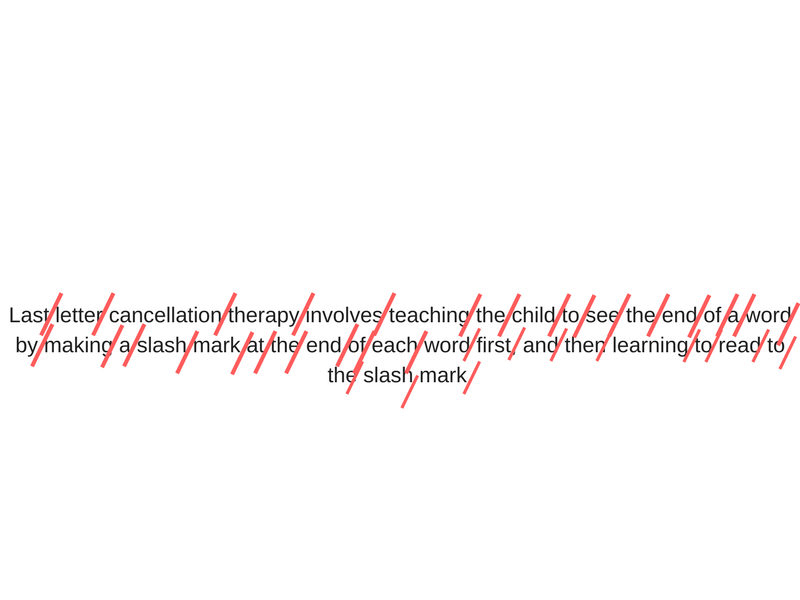 Last letter cancellation therapy Similar to the wood stick method above, this strategy requires the child with right hemianopia to first mark the last letter of a word before reading it. This trains the child to scan to the end of a word before reading it. Next line/first part of word therapy Similar to last line cancellation therapy, this method is for right-sided surgeries which result in left hemianopia. These children show difficulties locating the next line of text. This method teaches the child to scan to the subsequent line of text as well as to see the first part of the word. Seeing the whole word Provide the child with strategies so that the child sees the entire word and is trained to look at the middle/root of the word. When appropriate, small text ensures that more of a word is in the remaining visual field. Seating in the classroom should be where the child’s remaining visual field can take in what the teacher presents to the class as a whole. This may be in the back of the classroom for some activities, or in the front for others. When facing the front of the classroom and the teacher, the child with a right field loss should be seated to the RIGHT facing the front, with the teacher on the child’s LEFT. And the child with a left field loss should be seated to the LEFT facing front with the teacher on the child’s RIGHT. In a semicircular group, placement of the child with a visual field loss should be guided by the activities and where the child’s attention should be directed. If the goal is to attend to the teacher, then the teacher should be well in the child’s seeing field. If the goal is to interact with the other children, then the child with a field defect should be positioned so that as many of the other children as possible are in the seeing field. Positioning in the classroom needs continuous reevaluation by the educational staff. If the child can advocate for themselves, they can vocalize where the best position for their access to information is. Mark crucial features such as stairs and railings for better visibility as needed. Furniture and other objects should be located in the same place every day so as not to confuse the child. Introduce safety features such as Exit signs early and often.